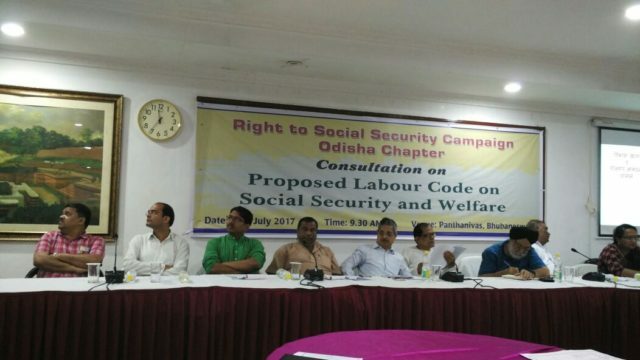 Bhubaneswar: The Right to Social Security Campaign, Odisha (RTSSC) organized a one-day State Level Consultation on the Draft Labour Code on Social Security and Welfare today at Panthaniwas. Trade union representatives, civil society members and social activists from more than 12 districts of the state, participated in the consultation. Vaibhav Raaj of the RTSSC made a detailed presentation on the provisions of the Social Security Code and its possible impacts on the lives of workers, mainly in the unorganized sector. Subash Singh, Chairman, Construction Workers’ Welfare Board, Odisha inaugurated the State Level Consultation. Sudarsan Das, Right to Social Security Campaign, Odisha presented a welcome note. Nirmal Gorana of the RTSSC said that it is a welcome move on the part of the government to think of social security of unorganized workers. However, there remain certain important concerns of the workers that need to be addressed by the government. Most senior trade union leaders of the state, including Sauri Bandhu Karaa , AITUC, Lambodar Nayak , CITU, Kishore Jena, INTUC, Joginath Tripathy, HMS, Basanta Sahoo, BMS, Naba Mohanty, Rama Krushana Panda, Reena Mohapatra, Rakhyakar, JMU actively contributed to the discussion on the Draft Code. D. K. Roy, Chairman HDF-cDAR and several intellectuals also expressed their reservations on key provisions of the Draft Code. Vaibhav Raaj of the RTSSC asked fundamental questions of the government vis-a-vis the Draft Code. He said that even in the 170-plus pages of the Draft Code document, it is not clear that which benefits are guaranteed; what is the quantum of each type of benefit; what are the elgibility criteria for accessing several of the benefits; why are workers’ representatives kept out of the monitoring and implementation systems under the Code and so on. He questioned the rationale for the proposal for investing the workers’ hard earned contributions to the social security funds in the market, when the state was unwilling to gie sovereign guarantee of the returns. 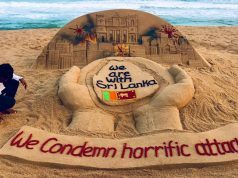 He also explained that prima facie it appears that financial control of the new system would be concentrated in the hands of the central government under the Code. If it is so, how effective and autonomous can be, any efforts of the state governments to provide social security to their people? The RTSSC is building a nationwide campaign to facilitate an informed public debate on the provisions of the Social Security Code. The Campaign hopes that the government will take notice of the grave concerns of the workers regarding the draft code and engage them in thorough democratic deliberations to clear all doubts and meet their demands. 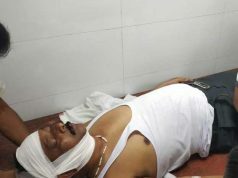 However, if the government failed to do so, the congregation of all the leading trade unions and civil society organizations of Odisha resolved to take to the streets to claim the rights of the workers. 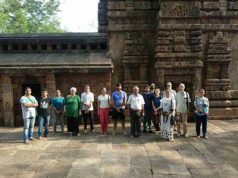 It was decided that over the next 4 months, participants of the RTSSC consultation will hold district-level conventions all over Odisha, submit memoranda to the Prime Minister’s Office through their District Magistrates and ultimately, in a state level convention demand the Odisha government to clarify their position on the Code. The RTSSC is poised to play a pivotal role in supporting all democratic processes to make the social security code a model law for worker-friendly governments of the world to emulate.